I wanted to start by thanking everyone who commented on my last post. It was heartwarming to hear from so many who also live with auto immune conditions, and to learn about the challenges they have overcome and the changes they have made to their life to find relief. It helps me to know that I am not alone in this and all I have to do is reach out to find friends. Thank you. It was also interesting to learn that this food problem is just as prevalent in other countries. I knew it affected other countries but I had also learnt that many countries overseas had stricter laws concerning food additives and preservatives. It seems that it is not quite the case. They may be restricting some but they definitely aren’t rushing to ban all of them. I do know that the US is the worst for what it deems acceptable for public consumption. So much so, that even China and Japan and many other European countries are restricting certain food imports from the US. I just hope our food people wake up and realise what the public really wants. Actually, we’re okay with just labelling; label the food and let people make up their own mind. Anyway, I’ll step down from my soap box now. So, I don’t know if I ever mentioned this before, but I was actually born in Saudi Arabia. I left there when I was 6 and moved to London where I grew up. I remember a little bit of my time in Saudi, just flashes of memories. However, the ones I do remember all have to do with food. Even as a youngster, good food left a definite impression on me. Most of the time we ate at home and that was pretty much always Indian. On the occasions we ate out or were at a wedding or event, the food was always Saudi; shawarmas, kebabs, rotisserie style chicken and Saudi rice and meat. Weddings and family meals were served Saudi style which is communal. As a child I though it was fun sharing food on a big tray, the ladies gathered around all digging into their portion of food on their side of the tray. Also, as a child born in Saudi, it was normal to me, even though we did not eat like that at home. It was different but my child mind was open to all possibilities. This Kabsa is a Saudi dish of chicken or lamb and rice. I think it is Saudi Arabia’s national dish since it’s so loved by all Saudis and all foreigners who’ve had a chance to taste it. It’s not particularly difficult to make but it’s has layers of flavour and thanks to the sultanas and almonds, lots of texture too. It is usually a heavily spiced dish and has a nice kick to it. Traditionally, it’s made by cooking the chicken with spices in water and then using the broth to cook the rice. The chicken is then quickly broiled to crisp it up a little and then served atop the spicy rice often with a salsa like sauce on the side. If I am making this for a dinner party, I like to cook the chicken and rice separately. I like to marinade the chicken with the Arabic spices and garlic and then bake it rather than boil it first. The rice I cook separately with spices and tomatoes in a chicken broth. I prefer this method only because I find the chicken stays more moist than the double cooking of boiling and broiling. Then I place the chicken and the juices over the rice and sprinkle the fried golden raisins and almonds. However, when I crave this during a week night, I cook the whole skin on chicken in the pressure cooker with spices and then use the broth to make the rice. I cut up the chicken and quickly broil it to crisp up the skin. Weeknight Kabsa usually does away with the raisins and almonds and I serve with a salad instead of the salsa. Just as good but done in less time. 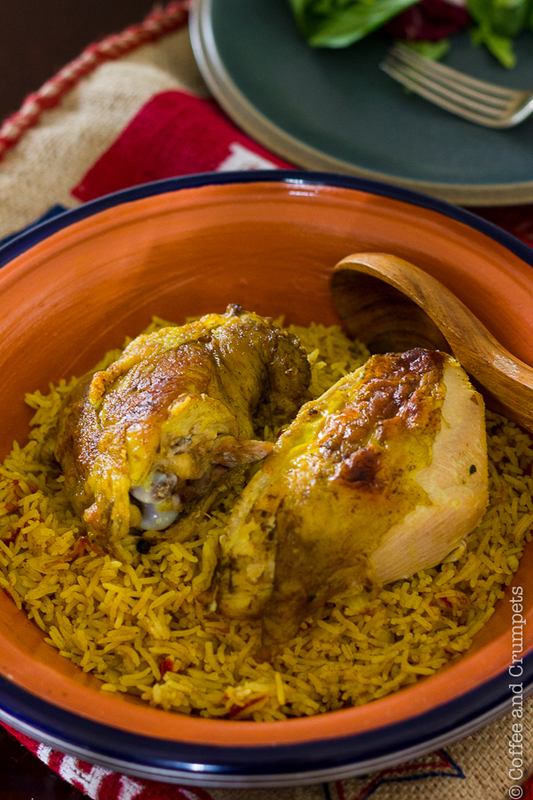 Today’s post is the easy weeknight Kabsa. I will do a post on the party Kabsa one day when I find where I put my recipe! I seemed to have misplaced my spicy rice recipe when we moved and I haven’t found it yet. This was before my blog so it’s written on some scrap of paper tucked inside a notebook somewhere in a box. Saudi style spicy chicken and rice dish. In a pressure cooker or a large dutch oven, place the chicken or chicken pieces, onion, carrots, garlic cloves, parsley, and the spices and cover with water. If using a pressure cooker, follow your cooker instructions and pressure cook for 20-25 minutes. If using a dutch oven, simmer the chicken until tender, about 60 minutes. After the chicken is cooked, slowly remove from the stock and place on a baking sheet. If your chicken is whole, you could cut into pieces or leave it whole. You can even just pull the meat off the bones and serve on top of the rice without broiling. Allow the broth to cool a little and strain into a clean bowl and skim off the fat. In a large pot, add the oil and lightly brown the onions. Add the cardamom pods and the cinnamon stick and toss in the oil. Add turmeric, the cayenne powder, the Bharat spices, mix thoroughly and cook a little in the oil. Add the tomatoes and cook until softened. Add the fresh chilli if using. Add in the rice and toss in the oil and spices. Pour in the hot broth, add the salt and allow to come up to boil. Simmer the rice uncovered until most of the broth is absorbed and the level of broth is the same as the rice and you can see little dimples forming on the surface. Turn down the heat to low, cover the pot and cook for 10 minutes. After 10 minutes, remove from the heat and without lifting the lid, let sit off the heat for another 10 minutes. After 10 minutes, lift the lid and fluff up the rice. While the rice is cooking, turn the broiler on. Place the baking sheet with the chicken under the broiler and cook until the chicken is crisped and browned. If using the almonds and golden raisins, melt the butter in a small fry pan and fry the raisins and almonds. To serve, place rice on a platter, arrange the chicken on top and scatter the almonds and raisins. Or, you can just dish it up on plates like I do with a salad on the side. Grind all the spices together and store in a clean jar. Hope y’all had a great weekend and are off to a great start to the week. My children are off for half term/spring break so they’re all home, being very trying. I did a big grocery shop and stocked up the fridges so they can eat themselves happy :). When they are home, that’s all they do, eat. Hope you’re having a great week!! Hear other people like the same. Nice website. I just had Kabsa with my family:) I’m from Saudi Arabia. yes we cook Kabsa as you said. Actually we have many types of Kabsa. we call them Bokhare, Boryani, white Kabsa, mthlotha,etc. the one u showed picture is called Bokhare. We learn how to make it from our moms. I wish I can make Kabsa for those people who saw ur pictures and feel hungry:))) I’m happy u like our food. Enjoy ur time and have a nice day. Hell, it’s not just additives and preservatives. I heard that in the US it’s completely legal for any random chicken battery farm owner to label his eggs any way he likes… so he could stamp “Farm-fresh, organic, free-range” on the front and it’s completely legal. What the hell is that about? Perhaps it varies by state? In any case, things like that are strictly enforced all across Europe, even down to semantics like whether something is “Made from strawberries”, “Strawberry flavoured”, or “Strawberry flavour”! Thanks Krissie 🙂 You are too sweet. The dish sounds amazing. Packed with flavors and I love one pot meals such as this one. Thanks for sharing. I am pinning it and I am going to soon make it on a weekend. Thank you Taruna! It is pretty tasty and I think you’ll like it. Nazneen, this chicken looks delicious. I don’t know if I’ve ever had Saudi food. Have you ever been to Sahara restaurant on east Arapahoe Road, just east of 1-25? I’m asking because I wonder if it’s Saudi? Stepping back onto that soap box, just yesterday a coworker and I were talking about packaged salads and the smell and flavor that some of them have. Now i’m on a mission to find out just what they rinse and preserve them with? Some of them don’t have that odor and seem clean (like the ones from Whole Foods) Do you know? I’ve driven past that place a few times but never been. Is it any good? My experience is that there are very few Saudi places as far as restaurants go. You can find many Lebanese. Palestinian and even Egyptian, but not Saudi…not sure why. Once in a while, someone who spent time in Saudi will recreate a dish in their restaurant. We had a couple in Houston with some some Saudi dishes. As far as the salad greens, most of the prepackaged salads are washed in diluted chorine, including organic. Some are washed in water that hasn’t been changed so it’s pretty dirty. It’s almost better to buy your own mix and wash it yourself. There is no winning! This chicken looks so tasty and flavorful! We can just imagine how the rice compliments it for a perfect lunch or dinner. Thanks Bam! I’ve grown tomatoes and chillies in containers and I prefer that in some ways. This year, I might try and plant a few things. I’m tired of paying an arm and a leg! Oh girl we have so much in common now 🙂 I was born in Saudi Arabia too but left when I was just 2 years old. I love Kabsa with chicken as we do not like lamb meat. Love your recipe and waiting for the party one… I thought I am the only person who keeps misplacing important things specially when moving. Such a nice dish…so comforting and tasty…like the color of the chicken and rice…yum! Thanks Juliana! I hope you are doing well too. Chicken and rice is one of those classic combos that almost every cuisine seems to have. I never tire of this combo. This is particularly luscious — really a great dish. Thanks so much for this. I agree, John! Every cuisine does have one. I love them all I think 🙂 Thanks, John! Thank you Charlie. I would have to disagree, it’s not that Saudi is unwelcoming to foreigners it’s just not a tourist spot. Honestly, there’s nothing to do there so why would people visit? Now there are plenty of foreigners there, all enjoying the tax free income, subsidised housing and food allowances. You get rich quick there, but people want the money and still want to bad mouth the country. I’ve been to Saudi many times, I’ve never seen a hand cutting in public, so I’m not sure what your friend saw. I wouldn’t live in Saudi, but that country offers quite a bit to foreigners and it’s unfair to say otherwise. It also houses two of my favourite spots on earth, the Kabah in Mecca and the grave of the Prophet Muhammad. Hello, Nazneen! I, too, was amazed to learn that there are problems in just about every country’s food supply. It’s astounding, isn’t it? For some time, I’ve been in search of a good chicken and rice recipe. I had one, years ago, but it’s long gone and those that I’ve tried are pretty much run of the mill. Yours, though, would offer a completely new flavor profile for me. I’m going to try this and since I’ve the ingredients, I’ll even make my own Bharat. I’ll come back to let you know how I did. Thanks for sharing your recipe. Have a good week, Nazneen. Thanks John! I hope you get to make it and more than that, I hope you like it! It is quite a flavourful dish and I love that it has some heat. with Indian recipes. I have a book by Madhur Jaffrey that includes a few of her family recipes. I love the flavor of Indian spices. Hey Nazneen I’ve almost missed this post… I love rice, I love mix it with spices, vegetables or meat… so your recipe is a masterpiece for my taste! beautiful photos my friend! Thanks Margherita! Love rice and all the things you can so with it! Bookmarked for my Sunday dinner this weekend. David Crichton recently posted..Guinea Fowl with Scallops, Chorizo and Red Pepper Puree and a Shellfish Bisque. Thanks Dave! Tell me how you like it! The next time you make this, I am available. Love the flavors, the photos and I bet it tastes great. Definitely deserves to be a national dish! Thanks GG! I hope the guys like it! It’s very flavourful and has a lovely kick to it. I love all the warm, aromatic spices that went into this! That rice sounds and looks absolutely amazing. I love rice with a bit of flavour. Thanks Holly. This certainly has flavour! This looks and sounds pretty amazing Nazneen! If memory serves me well, I have had something very similar in an Arabic restaurant in Abu Dhabi – I never thought to replicate it – but your post is bringing back delicious memories! Thanks so much David! You are so sweet. I can find fresh turmeric at my Asian market and I actually have some in my freezer. I’m afraid to use it because it stains everything yellow! Nazneen, you have me drooling here! Oh my gosh – this looks wonderful. I wish I could look behind your shoulders and watch you cook all this wonderful food and smell all the aromas. : ) That pic with the golden rice is just beautiful. Good luck with spring break and all the busy cooking you’ll be doing to feed the hungry masses. : ) They are lucky children. Take care! Thanks Laura! No rest for the wicked! I’m so tired this week because I had no rest last week! Argh! What a beautifully executed dish. When I was young I would take out all the nuts and sultanas from the Kashmiri pulav .. but now the mere mention of those in a rice dish makes my mouth water. The only Saudi rice dish I know making is the Bukari. Thanks for this lovely recipe. this recipe sounds so good! I was going to ask what the spice mix was made out of and continued to scroll down through the post and see you posted it. I might get on line and see if I can find it already made to order some as our small stores here do not always have a good supply of spices! it gets harder to find spices all the time for some reason. Hi Karen, thank you! Yes, if you what to check on line you should be able to find a ready made package, it’s what I use. I have access to big ME grocers here though. You can use a 7 spice mix too if you can find one labelled “Bharat”. Thanks for your comment! This is my type of meal: Comforting and mouthwatering! I have to make this one day to enjoy both the rice and chicken robust flavors. I am a spice lover! Thanks Denise! I know you will love it because it does have some powerful spices. You can make it as hot as you like too. It’s delicious! I had this dish once t a friends home and loved it. Thanks Daniela! I’m so glad I could share this with you! It is incredibly flavourful and I’m glad you’ve had the chance to experience it. I have a thing for turmeric in rice…I find it irresistible starting from the Biriyanis. And yes, it reminds me so much of our tradition too. This dish looks so wholesome, aromatic and delicious. Spices do make everything nice. I hope you are feeling better now Nazneen. I have been wanting to make a middle eastern style ‘biriyani’ for ages now. Interestingly, my Ma has a very similar recipe for a mutton biriyani she makes, which she learned during her stay in Iran. She does not use all spice though or parsley. I have baharat with me that a dear brother sent from israel last year. I wonder if their ingredients are same….. I am so making this. This dish is actually more of a Yemeni dish but I think it made its way to Saudi through immigrants and they have run with it! Iranian rice dishes never have the same spice, and are rarely hot. They rely on saffron as their major spice but use lots of dried fruit and nuts. I bet the recipe she has is pretty awesome. I love Iranian food. I have some pullao recipes from Iran that I will eventually post. Thanks Minnie! Dear Nazneen, I have never prepared a Chicken Kabsa or heard of it. The recipe sounds very intriguing with all those spices – I even had to look up what the spice mix Bharat contains, as I had no idea – sounds wonderful to me, must give this lovely recipe a lot of depth of flavor. The colors of the rice and the chicken together with the side salad are just amazing, the photography is absolutely stunning! Hope you are feeling well these days! Easily one of the best chicken and rice dishes in my book.